So, I was basically a nervous wreck all day yesterday, waiting for election results and watching cable news obsessively. I knew I needed some comfort food so I put my nervous energy to work in the kitchen, layering flavors, creating something delicious and keeping my mind occupied. 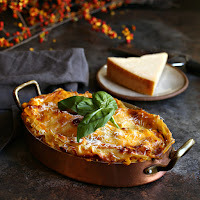 Whether you were happy with the election results or not, this lasagna will definitely comfort you. Instead of the traditional meat and tomato sauce, I chose one of my favorite fall flavors, butternut squash, and one of my all time favorite flavors, Parmigiano-Reggiano. I buy the imported variety which contains only milk, sea salt and rennet. 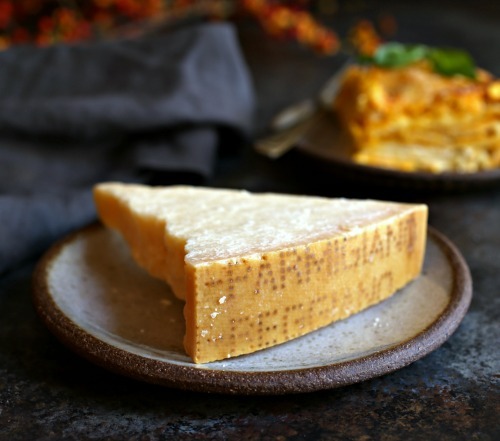 You can distinguish it from domestic Parmesan by the name spelled out in pin dots on the rind. I pretty much always have butternut squash around this time of year so I roasted mine and then pureed it in a food processor. You can also cut it into chunks and steam or microwave it. In a pinch, you can even use the frozen winter squash puree and still get a great flavor. I seasoned it with plenty of black pepper to cut through the sweet, creaminess of the sauce and tossed in a good bit of sharp fresh basil. The result was heavenly. Sweetness from the butternut, sharpness from the Parmesan and basil and creaminess from the bechamel sauce. Comfort in a bowl. Enjoy! Cook the lasagna noodles in a large pot of boiling salted water, according to package directions. Drain and set aside. Make the squash sauce by adding the butter and garlic to a large skillet and sauteing for a minute, just until the garlic begins to get translucent but does not color. Whisk in the flour until the granules are thoroughly coated with the butter and then slowly, over low heat, whisk in the milk. Continue whisking for a few minutes until the mixture begins to thicken. Stir in the butternut squash puree, Parmesan cheese, salt, pepper, nutmeg and fresh basil. Assemble the lasagna by spreading a couple of spoonfuls of ricotta cheese on the bottom of a baking dish (approx. 7" x 10"), add a layer of noodles and, if they're larger than the pan, trim off the edges with a knife or kitchen shears. Next, spread on a couple of spoonfuls of the squash sauce, another layer of noodles, another couple of spoonfuls of ricotta, about 1/4 cup of the mozzarella and a couple of spoonfuls of Parmesan. Repeat as many layers as you can fit and top with the last of the mozzarella cheese. 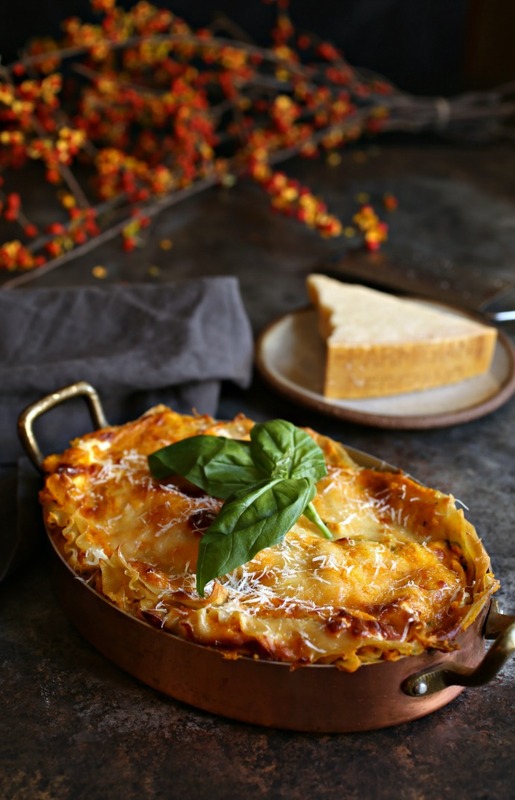 Bake for approximately 45 - 50 minutes or until the lasagna is a light golden brown. Note that this recipe may be doubled. This recipe is sponsored by Parmesan.com. For more recipes and information on the authentic cheese, visit their web site and follow them on Facebook, Pinterest and Twitter. Thank you for supporting the products I love and use in my kitchen. Wow…this looks and sounds delicious! I will have to try it. Thanks for sharing! 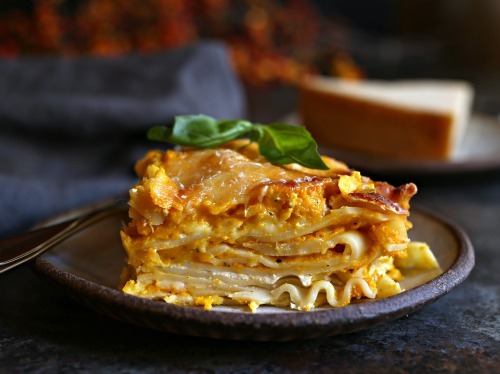 Hi Anita, I was looking for new recipes to cook with my husband this weekend, and was very lucky to find this one because lasagna is our favorite dish. Pretty well explained with super cool pictures of the final dish. I'll let you know how it goes. Thanks for sharing!